Just in case the legal comings-and-goings of Psystar weren't enough for you, another California courtroom is playing host to a possible precedent-setting tech case. FBT's legal team argues that a download is not, in fact, a purchase of music, but rather a license issued through a retailer (such as iTunes). As such, the percentage that the artist (in this case, Eminem) takes home at the end of the day should be higher, in accordance with licensing terms. Universal, meanwhile, appears to be arguing that purchasing digital music for download is no different from buying a CD or LP. 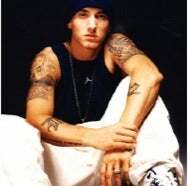 If FBT prevails, Eminem and others artists could see their royalties go up from 20 cents per purchase to about 35 cents, reports industry publication The Wrap. That could buy a whole lot of fake slim shadys.